In the early 1990s, South Korea was showcased as a country that had combined extraordinary economic growth with a narrowing of income distribution, achieving remarkably low rates of unemployment and poverty. In the years following the financial crisis of 1997–1998, however, these rates ballooned to pre-crisis levels, giving rise to the perception that the gap between the rich and the poor in Korea had once again widened. 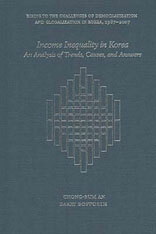 Income Inequality in Korea explores the relationship between economic growth and social developments in Korea over the last three decades. Analyzing the forces behind the equalizing trends in the 1980s and early 1990s, and the deterioration evident in the post-crisis years, Chong-Bum An and Barry Bosworth investigate the macroeconomic conditions, gains in educational attainment, demographic changes and conditions in labor markets, and social welfare policies that have contributed to the evolution of income inequality over time. The authors also raise fundamental questions about whether the pre-crisis pattern of combining strong economic growth with improving equality can be restored, as well as how government policies might be designed to promote that objective. The book concludes with a discussion of some proposals for improving the efficacy of redistributive policies in Korea.